We just learned about the type of dog the Old English Sheepdog. 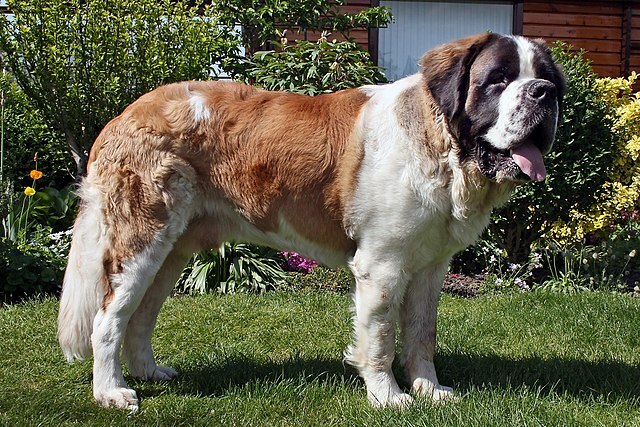 Another type of dog is the St. Bernard. It is a very big dog, and can get as big as 260 lbs, heavier than a grown person! They can get as tall as 3 feet tall, about waist height on a person. Long ago in a mountain area that has a lot of snow, some people used these dogs to go out in the snow and rescue people that were stuck from avalanches or just out in the cold too long. One dog named Barry saved the lives of 100 people! He was so famous that they made a statue of him. These days there are safer ways to get through the mountains so people don't use St. Bernhards for rescuing anymore, but they are still great dogs.